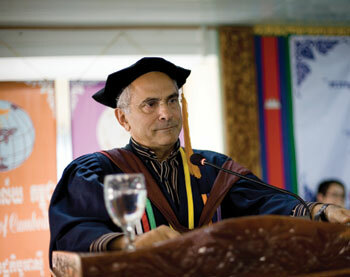 Jose Ramos-Horta, the president of East Timor and co-recipient of the 1996 Nobel Peace Prize, spoke to the Post on Thursday about the challenges of nation-building and development, and similarities in the evolution of democracy in East Timor and Cambodia. He is visting Cambodia on a three-day trip as part of the International Peace Foundation’s event series “Bridges – Dialogues Towards a Culture of Peace”. The programme is intended to foster dialogue between Nobel laureates and students. Cambodia and East Timor share the challenge of having to “move on” after enduring years of mass atrocities, despite the fact that many of those responsible for the mass atrocities have yet to be held accountable. How has East Timor worked towards reconciliation domestically, and with its former occupier, Indonesia? Rather than pushing for trials of everybody involved in past violence, we pursued different avenues through the mechanism of truth and reconciliation. This absence of prosecutorial justice as seen from the perspective of the UN or other Western countries has no bearing with the reality on the ground in [East Timor] or [between East Timor] and Indonesia. You don’t see in my country a single act of conflict between the pro-independence and the pro-Indonesia factions. In the terms of the relationship with Indonesia, even though there has not been a serious effort to try anyone in Indonesia responsible for the violence in [East Timor], this has not constituted an obstacle for [East Timor]and Indonesia to normalise relations and today to have an excellent relationship. What parallels do you see between the reconciliation processes in East Timor and Cambodia? I am very impressed with the fact that in spite of the huge tragedy that befell the Cambodian people … and the lack of a trial not only of senior [officers] but middle-level and junior cadres of the Khmer Rouge … that there is no street violence, there is no indiscriminate persecution and killing of past enemies. The Cambodian people have shown an extraordinary ability to let the past go. It is not a question of forgetting the past, but [of] not becoming totally obsessed and hostage to the past, particularly when the past is a very tragic one. It is a situation that should actually be a lesson to many other post-Civil War/post-conflict countries. The Cambodians have been able to transition from the tragedy of the past into, today, a very dynamic, robust economy with a functioning democratic system, with all its imperfections, like any democracy, particularly emerging democracies. How are Cambodia and East Timor similar in terms of their oil and gas resources? From what I’ve read, Cambodia also has tremendous potential oil and gas, and other minerals, [which could] significantly transform this country into an economic powerhouse in Southeast Asia. Cambodia is very fortunate that it has hard-working, resilient people … and if on top of it, it has oil and gas revenues soon, it will completely transform Cambodia. But what is critical in [East Timor] and critical in Cambodia [is to] not allow oil and gas wealth to destroy all other areas of the economy, particularly agriculture. Oil and gas, as such, do not create jobs. We must use oil and gas revenues to invest more in agriculture to guarantee food security, as well as using the revenues to invest more in education, in health. The best investment that we can do in the long term is investment in the people … as well as in job creation to eliminate poverty. Nigeria and a few other countries. Never fall into the trap of getting flooded with money from oil and gas and forget the rural areas, agriculture, small industries, and so on. East Timor has a largely rural, poor population, and most of its people survive on subsistence farming. What kinds of initiatives has East Timor undertaken to create jobs and develop industry? [East Timor] has expanded investment in the agriculture sector … expanded in the area of cultivation with the provision of hundreds of new tractors [given] to small farmers. We are also working toward increasing productivity because up to now productivity [has been] extremely low. We produce no more than 2 tonnes per hectare, compared with Cambodia [and] Vietnam where the average is 5 to 8 tonnes per hectare. But with the new technology introduced – new seeds, new techniques – in some areas [productivity] has gone up. Cambodia has a track record of frequently granting economic land concessions to private businesses and high-ranking government officials, some of which lead to forced evictions. As development picks up in East Timor, how will your government work to avoid these same kinds of problems, given that many people in East Timor do not possess land titles? The government and parliament are discussing a land and property law. We hope that it will address many of the problems that we face. I do not think that [East Timor has] a huge problem of the government granting land in an arbitrary fashion. From my honest understanding, it is actually the opposite [in East Timor]. It is actually a very tedious process for any investor to try to get land for a project. Some land has been granted to some dubious individuals in my country, local [people], but these are issues that are easily overcome ... with a new law [implemented by] the Minster of Justice.